The scientists with the expertise simply don’t have the resources to do the large amount of computer modelling required. However, there are a number of conclusions about rising temperatures that researchers have gleaned from previous studies on tropical cyclones in the region. While Cyclone Idai is the seventh such major storm of the Indian Ocean season – more than double the average for this time of year – the long-term trend does not support the idea that these type of events are now more frequent. "If you look at North America, they are experiencing Category 5 cyclones quite regularly now, and they don’t experience the level of damage that Mozambique is seeing," said Dr Fitchett. "When a storm like this comes along, the potential for devastation is infinitely higher. A city like Beria is at much higher risk, because not only have you many more people there, it’s also so much more difficult for them to get out." Usual BBC tactics – find a junk scientist to spout falsehoods which they could not get away with themselves. 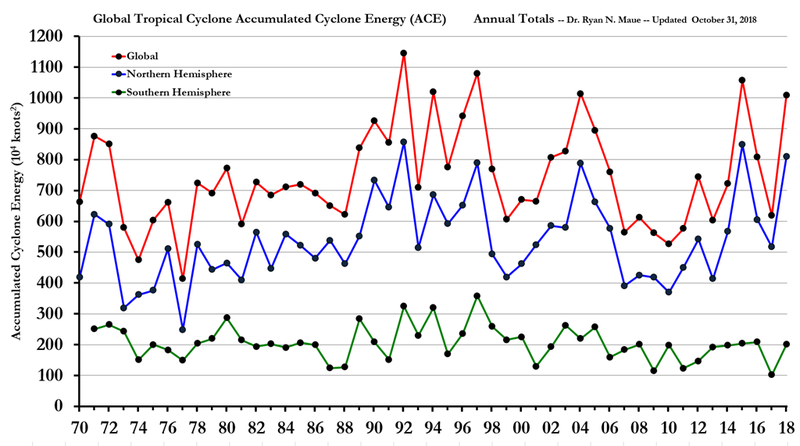 And despite the assertion that there is absolutely no doubt that when there is a tropical cyclone like this, then because of climate change the rainfall intensities are higher, even the IPCC has had to admit that there is little empirical evidence to back this up. In fact the last hurricane to hit North America at Cat 5 was Dean in 2007, when it made landfall in Mexico. The previous one was Andrew in 1992. In all there have only been seven such hurricanes since the Labor Day one in 1935. Surely any scientist who claims to know about hurricanes should know all of this? 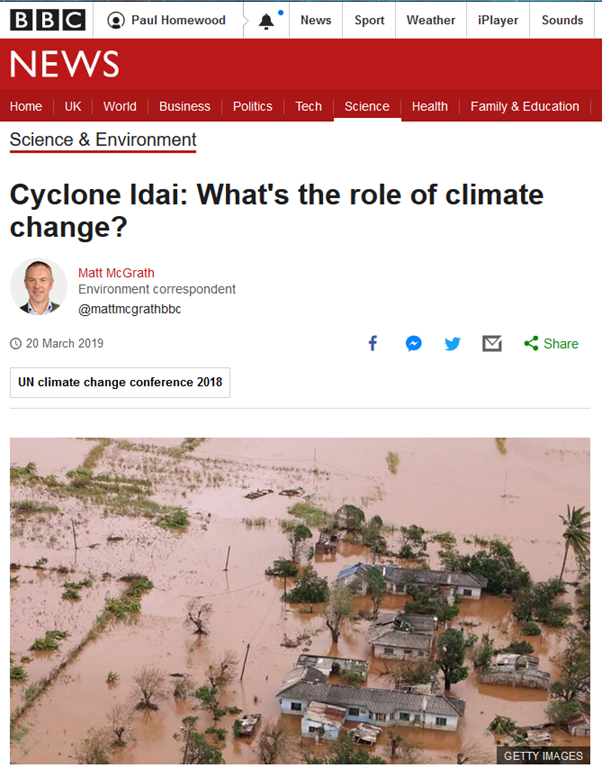 But when did the BBC ever bother with facts, where climate change is concerned? That applies particularly to Prof Otto, acting head (i.e. fundraiser) of the Environmental Change Institute somehow attached to Oxford University. Look at the data perhaps? Oh, yeah, silly me, that might show the truth where you can produce a model to give BS! I sense a complaint to the BBC coming on. Except on the East coast of the USA which, before 2017, had gone 12 years without landfall of a major hurricane. By the metric that Idai is evidence of climate change, the same must be true of the lack of hurricanes in the US over that 12 year period. No climate change for 12 years then. Condemned by their own puerile logic! Without linkages this event was episodic event – nothing to see here. Given the failure of modelling how would more study adduce anything. As Climate Change is being used as a cause for everything, I venture to say the Brexit Storm must be due to it. My dog was sick this morning, because of climate change, oops maybe it was brexit that made her sick? maybe it was a climate brexit breakfast change. Yes thats it. Climate brexit breakfast change caused an earthquake yesterday. Hell, i’m so factual i should be on the BBC! I’m sure that mass murdering Stalinists cross the minds of these people sooner than the port of Beira. I was down in South Africa about 20 years ago when a similar storm had hit Mozambique, forcing me to choose a different safari as the runway was underwater at my original choice. The flooding in Mozambique was extensive and at least it was reported without climate change allgations by the South African media. The common thread behind this BBC article is geography, both Fitchett and Otto are geographers, not scientists. I wonder if McGrath knows that. They are entitled to talk about the phenomenology of cyclones, as long as they get it right, but not about explanations. You might be making the mistake of assuming that McGrath wished to produce an accurate article. Past form and his chosen employment suggests he didn’t. Everybody (including Fitchett) knows that wind speed data are very sparse before around 1980, but outright lies now seem to be OK. Climate is one of the most complex, non-linear, chaotic systems known to man (or person!) To ignore chaos is fraud. To claim that any extreme weather event is caused by man’s activities is fraud. Isn’t it a bit rich that the BBC empoys “fact checkers” to ensure Brexiteers don’t get away with anything, but go in entirely the opposite direction on this topic? If you need millions to build a computer model to find out, i can tell you the answer now for free – it played no role. 1 The Maputo tide gauge station appears not to have enough consistent data to make any conclusion about sea level. Perhaps satellite data might show something more definitive. 2 In any other business you would be fired for the consistent falsehoods such as the climate journalist at the BBC write because your business would be sued for fraud. The once reliable BBC has become a propaganda institution for the leftist /green/UN agenda. The last time this happened was the mid to late 30’s in Germany. History is repeating itself. How easy it was for the NAZI’s to manipulate the youth at the time! We live in dangerous times and it is not the climate we need to worry about. I haven’t looked at the detail much but when I started digging around a few days ago it looked like records of storms hitting S.Africa are the most incomplete of all globally, but I immediately found Eline in Feb.2000 which seems to have had pretty much the same levels of deaths/damage. So it is probably typical of occasional weather in the area. Of course without fossil fuels no one would be rescued, or fed, and no rapid or substantial rebuilding would happen. That would have been the one I referred to in my post above. You remind me it was February. I couldn’t get into Skukuza (not far from the Mozambique border at the Southern end of Kruger NP), so went to Timbavati via Hoedspruit instead. I missed out on the hippos in consequence, but we had several leopard sightings including floodlit by the Land Rover at night up a tree along with the rest of the “Big 5”. It had dumped just enough rain into the Oliphants River that our Land Rover got stuck attempting to cross a ford at one point, and we had to be winched out. Since then they have had some white lions again. The preceding rain meant that the dust was kept down, which improved photography – but it also meant the bush was lush, which made some sighting more difficult. Still, off-roading helped. You could see how the rainy season would have flooded the river much more substantially from the water scouring of the landscape. If alarmists think they can see what they wanted to see in weather or nature – that’s ‘climate change’, meaning you naughty humans. Anything else can be ignored or waved away in their blinkered world view. Would like to share my work on trends in tropical cyclone activity and its relationship with SST. The Pungwe flats are what they are, a flood plain. So it is not surprising that the are subject to flooding. Beira as well and I well recall Beira being flooded knee deep,and after a few hours, tumbleweed would be blowing down the streets. In 1975 there were, statistically, 4 number 1000 year rainfall events in present day Zimbabwe. A Zim I was talking to earlier today said a friend once sent him some shots of snow in Gwelo, central Zimbabwe. Several feet of it, almost unheard of, water table wonderfully replenished so everyone delighted. 1971 Felic(i)e 42,650 km2 flooded – “worst in history” (3,000km2 claimed for Idai?). Hardly looks like Idai is ‘unprecedented’. This is based on Fitchett and Grab 2014 “A 66‐year tropical cyclone record for south‐east Africa: temporal trends in a global context”. 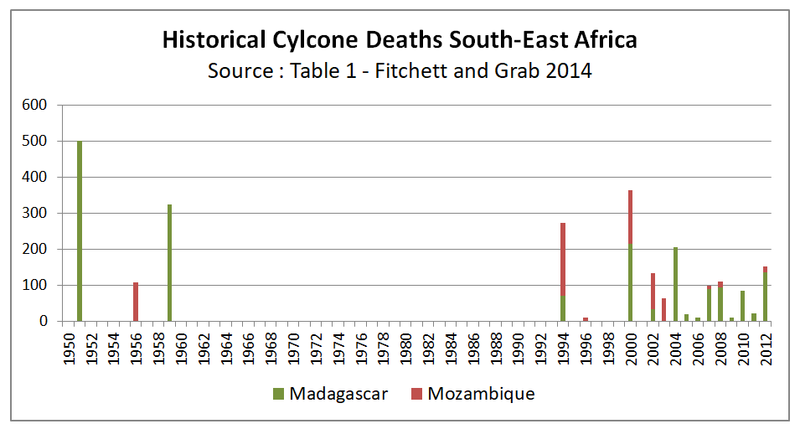 From Table 1 details the recorded cyclones in Madagascar and Mozambique. I have listed the deaths from these events. In Mozambique there was a War of Independence covering 1964-1974 and, following Independence, a Civil War 1977-1992. During this period I find it unsurprising that there is a lack of data. How would sea level rise of a few centimeters have impacted on the severity of flooding in land-locked Zimbabwe and Malawi? Both are at well over 100 miles from the sea. Even a few meters of sea level rise would make no difference. Maybe climatology, does not teach people to look at a map.